It has been more than two years, the memories of my Lakbay Cordillera still wows me. :) If there is anywhere in Philippines that should not be missed, I'd say a trip to Banaue and Sagada. The long ride was tiring but it was still worth all the hassle, at least once in your life. 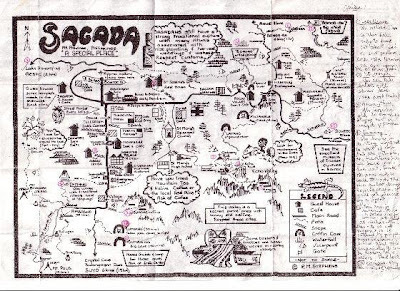 If you want to go underground without special training and equipment, Sagada is your best bet. The town sits in a limestone valley riddled with over 60 known caves. The Sagada caves feature shimmering underground streams with golden or silvery stalactite and stalagmite formations and cool natural pools inside. Sumaging Cave, the largest, can be explored by anyone with a local guide; the basic tour lasts around three hours but it is possible to spend an entire day inside. If there is anything you should not miss, it's this. I've never seen other cave in the world that clean and nice, the experience was equally great: spelunking barefoot at one point, holding on ropes seemingly wall climbing like spiderman, submerging in ice cold water and who would ever forget the bat dung. 1-4 persons - php 500 -1 guide; 5 persons - php 600 - 1 guide; 6-9 persons - php 1000 - 2 guides; 10 persons - php 1200 -2 guides; 11-14 persons - php 1,700 - 3 guides; 15 persons - 1,800; 16 to 20 persons - 2,400 and above is 150 per head. backpackers can opt for cheaper accommodation starting from P150/bed space. Others suggest George Guesthouse #09185480406 or 09206070994 or Masferee Inn, complete list of contact info of accommodation found here. 1. Hire a van from Manila (10 hrs per way with stops) for P3,000-7,000/day with driver plus gas and board & lodging - this is the most convenient. Airconditioned Autobus leaves Manila at 10pm daily, and with 2-3 brief stopovers along the way, the bus arrived in Banaue at 7am. Then, a short tricycle ride from the terminal to the town proper to transfer to a jeepney going to Bontoc (2hrs) and transfer to another jeepney bound for Sagada (1hr). Leave Sagada at 6am for a 6 hour ride to Baguio via a non-airconditioned Lizardo Transit bus. The fresh air is very soothing to your weary bones. From Baguio, another 7 hour trip in an airconditioned Victory Liner bus to Manila. * Guided Trek in Batad Rice Terraces, Banaue, Spelunking in Sumaging Cave, Site Seeing in Lumiang Burial Cave, Echo Valley, St. Mary's Church, view of Sugong Hanging Coffins.